Very Good. 0310247527 cover is different to picture. Very Good. 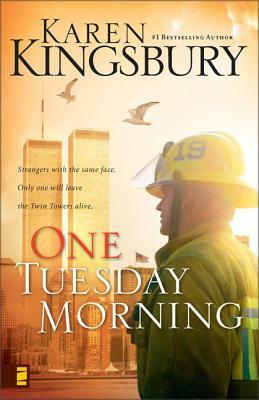 One Tuesday Morning (9/11 Series) by Kingsbury, Karen, 2003-04-17. Trade paperback (US). Glued binding. 352 p. Contains: Illustrations, black & white. 9/11, 1. Good. A devoted fireman and a driven businessman, strangers with the same face. On that fateful Tuesday, one will leave the Twin Towers alive--but will he ever find his way home? Winner of the Silver Medallion Book Award. Trade paperback (US). Glued binding. 352 p. Contains: Illustrations, black & white. 9/11, 1. New. Trade paperback (US). Glued binding. 352 p. Contains: Illustrations, black & white. 9/11, 1. Enjoyed reading very much. Didn't want to put it down. Started reading next book as soon as first one was finished. Karen has done it again ! Karen's story of 911 has definately effected everyone who has read it. A beautiful story of such a sad time for America and all who were there. A 5 star book ! GRAB THE TISSUES!!!! You will need a extra large box of tissues for this one. Two men that share the same face, one a fireman and the other a business man. One dies and one survives. The survivor suffering from amnesia goes to live with the wrong family while his family is grieving his loss. If I were to tell you which one dies and which one survives then why would you want to bother reading the book? This book is a sure tear jerker, espically following the events of 9/11!